This past Saturday my friend Chow and I decided to tackle a combination I have heard a lot about but eaten only twice: fried chicken and waffles. A classic of Southern US regional cuisine, the two go together better than I imagined. The waffles were light and tangy thanks to buttermilk and egg whites, which are folded in just before cooking. To give the chicken an extra layer of flavor, Chow whipped up a sauce of hot green chilies, cilantro, lime, vinegar, and honey. The kick cut through the richness of the meal. We also prepared a slaw of cabbage, beets, daikon, and carrots plus a salad of cucumbers, sour cream, and dill. All in all, a tasty Saturday night feast. 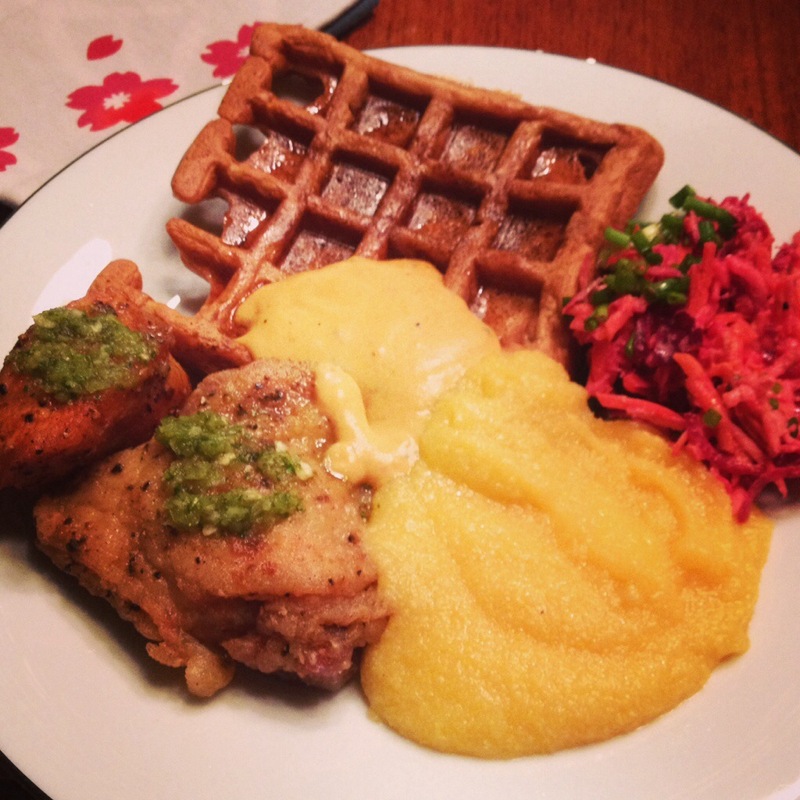 This entry was posted in Cooking, Food and tagged cooking, food, fried chicken, waffles by christao408. Bookmark the permalink. Oh yum and it looks as good as I bet it tasted. Yes, it was pretty good. I like waffles and fried chicken but never had them together. Nor had I, until about a year and a half ago. Southern food has some “weird” combinations. Was the waffle very sweet or more neutral in terms of flavor? The waffle itself is pretty neutral but once you add some gravy or maple syrup, it is just like a crispy biscuit. Interesting. All I recall of southern food is “grids” (not sure about the spelling) which had a funny flavor. Not bad but also not great. Not really a fan of it. I love grits! I like to put my runny Sunny Side eggs up in it! That’s “grits” beowulf222, y’all! Icky stuff, if you ask me, but lots of people eat it. I’ve heard a lot about waffles and fried chicken lately, but I doubt that I will try it. I think it’s just a trendy thing. I’ve never been crazy about waffles, anyway. It’s hard to get all the little holes filled with syrup! I love both on their own so it doesn’t surprise me that they are delicious together! The green chili sauce is making me mouth water! The chili sauce really pulled it all together nicely. Not in my part of the South. I’m not sure why I associate it with the south. Waffle House maybe? it’s been a long time since i had grits. i like the texture. similar to hot polenta. kinda reminds me of rice porridge. though rice porridge tend to be more flavorful. Really the same thing as polenta, except grits are usually made with white corn rather than yellow. You sure live a grand life, if new foods are any indication of how you live the rest of your life! 🙂 Thanks for the inspiration! I am going to try waffles with fried chicken (probably in Los Angeles since that is close by to me) this year!